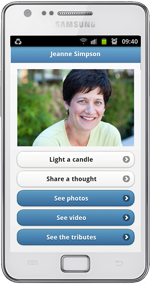 Access your memorial from a smartphone, a tablet or a mini tablet. What type of smartphone do i need to access to my memorial ? 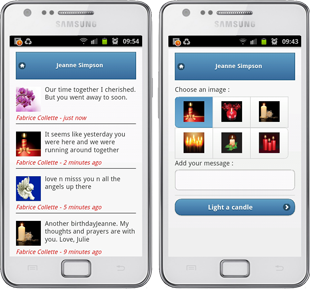 You can access your memorial with any type of smartphone, tablet or mini tablet. Type the address of your memorial in the adress bar of your smartphone navigator, and the appearance of your memorial will automatically adjust to your smartphone. MemoryIslife mobile access is compatible with the IOS systems (Iphone, Ipad mini, Ipad), Android, Windows Mobile and more generally with all smartphones abble to connect to internet. Do I need an additional subscription to access from my mobile ? The access to your memorial from a smartphone, a tablet or a mini tablet is included in the "Premium" and "Premium Unlimited" subscriptions. Is it possible to share a thought at any time with mobile access ? At any time, everywhere, you can share a thought or light a candle in memory of a loved one. You just an internet access from your smartphone, tablet or mini tablet. Who can access the memorial from mobile ? The same people who are allowed to access to you "internet" memorial are allowed to access to its mobile version: "public", "only family and friends access" or "private". What are the other features of the mobile access ? 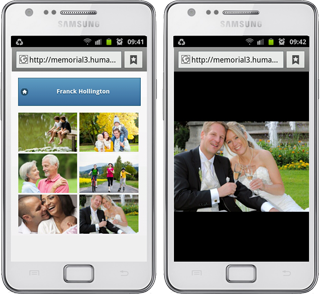 You can watch your to memorial photos and videos from your smartphone, at any time you want and everywhere you want. This is an easy way to remind the good times, with family and friends or by yourself.